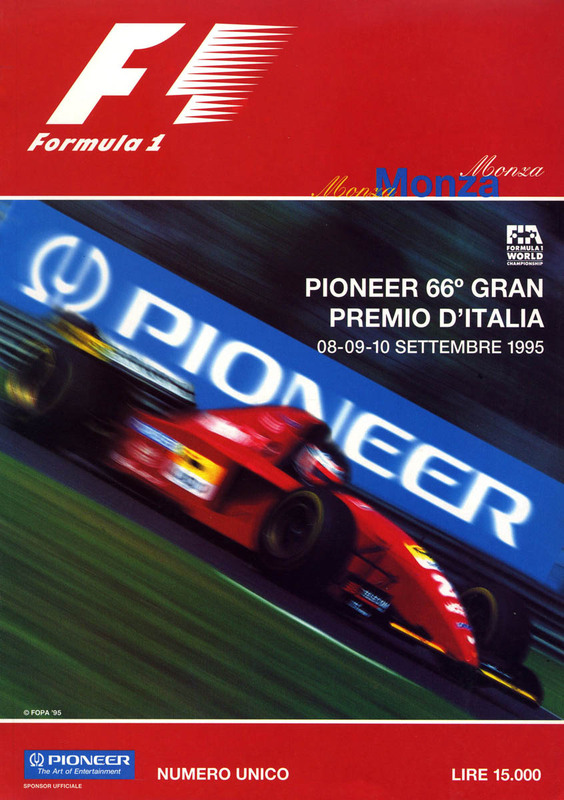 The 1995 Italian Grand Prix (formally the Pioneer 66o Gran Premio d'Italia) was a Formula One motor race held on 10 September 1995 at the Autodromo Nazionale Monza, Monza, Italy. It was the twelfth race of the 1995 FIA Formula One World Championship. The 53-lap race was won by Johnny Herbert, driving a Benetton-Renault, after starting from eighth position. Mika Häkkinen was second in a McLaren-Mercedes, with Heinz-Harald Frentzen third in a Sauber-Ford, achieving both his and the Sauber team's first F1 podium finish. Pole-sitter David Coulthard spun off on the warm up lap, and initially retired from the race. However, when the race was stopped after a second lap collision (on dust he had dragged onto the corner when attempting to rejoin) he was able to start the race on pole again (in a spare car set up for Damon Hill). Hill and Michael Schumacher had their second major collision of the season; the previous one having happened at the British Grand Prix. As Hill attempted to lap Taki Inoue's Footwork, Hill crashed into the back of Schumacher when braking for the second chicane, causing both to retire. Schumacher ran over to the Williams to confront Hill whilst the British driver sat in his cockpit, but was immediately pulled away by marshals. Schumacher later apologised to Hill when Inoue admitted the incident was his fault, as he had slid in front of Hill while being passed by Schumacher, causing Hill to take evasive action and inadvertently run into the back of Schumacher's car. This briefly left the Ferraris running first and second. However, Gerhard Berger suffered a bizarre retirement when a TV camera on Jean Alesi's car flew off and destroyed Berger's suspension. Alesi led the race with just 7 laps to go but subsequently retired with wheel bearing trouble. This succession of retirements handed a second victory to Johnny Herbert, and then best-ever results to Mika Häkkinen and Heinz-Harald Frentzen - the first podium finish for the Sauber team in F1. Massimiliano Papis was on course for his first points finish, until he was overtaken by Jean-Christophe Boullion on the final lap. Wikimedia Commons has media related to 1995 Italian Grand Prix. ^ a b c d Henry, Alan (1995). "1995 Grands Prix: Italian Grand Prix". Autocourse 1995-96. Hazleton Publishing. pp. 190–191. ISBN 1-874557-36-5. ^ "Motor Racing Programme Covers: 1995". The Programme Covers Project. Retrieved 12 November 2017. ^ a b "1995 Italian Grand Prix". formula1.com. Archived from the original on 2 November 2014. Retrieved 24 December 2015. ^ "Murray's Memories: Johnny Herbert wins the 1995 Italian GP". BBC Sport. 4 September 2013. Retrieved 23 October 2013. ^ a b "Italy 1995 - Championship • STATS F1". www.statsf1.com. Retrieved 18 March 2019.